This article is created with the main purpose to show you how to remove Rodeo Scam Tor browser from your computer. 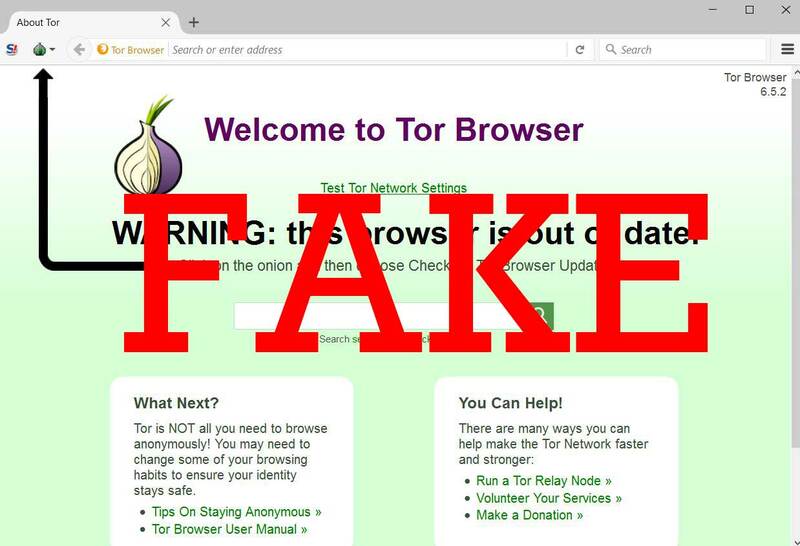 Believe it or not, the fake web browser wave did not surpass the notorious Tor browser as well. 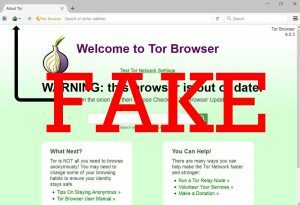 A fake web browser, which claims to provide access to some particular locations in the deep web has been reported by malware researchers to be a complete sham. The browser only pretends to be Tor, but instead of communicating via the Tor network, it displays a page directly coming from a third-party web server. The website, which offers illegal activities displayed by the browser, called Rodeo Marketplace and claims to sell illegal things (drugs, weapons, etc.) online is also a scam. So, in case you have become a victim of this web browser, we recommend that you read this article, learn more about it and how to remove it properly. Type Malicious and fake TOR-like web browser that is a scam. Short Description Aims to lead the a user to what appears to be a phishing web page of a site, known as Rodeo Marketplace which is also a scam. Distribution Method Advertised on forums, the dark web and other suspicious online marketplaces and web sites. User Experience Join Our Forum to Discuss Rodeo browser. Links in YouTube tutorials on “How to Install Rodeo Browser” or similar. If you see the advertisements to this browser, it will likely lure you into clicking on it, because of the browser’s “main advantage”. 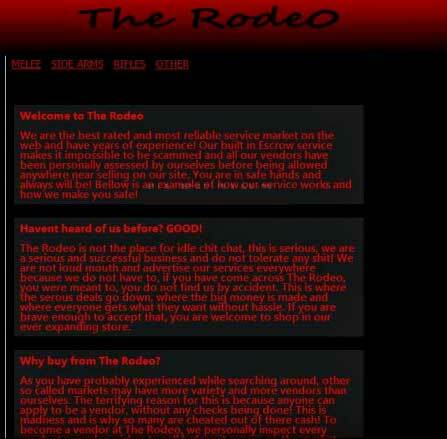 It advertises the so-called Rodeo Marketplace – a fake deep web marketplace, only accessible from this browser. It offers many illegal objects, like weaponry, drugs, substances and many others. However, you must not download the Rodeo browser, since it is nothing but a sham. In addition to this, the Rodeo browser features multiple BitCoin wallets where you must pay in BitCoin if you want to order an illegitimate services. 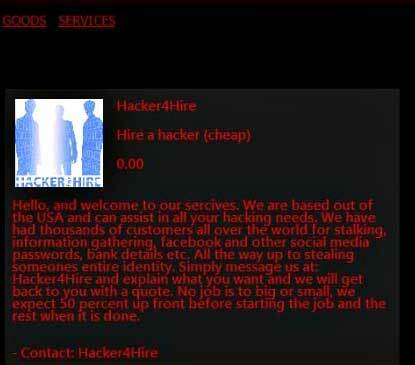 So it is a fake website of a legitimate website – really clever. Once you have paid in BitCoin, the service is anonymous and you do not get any contact or product back. And whenever the users pay something in the site, they actually pay it to the cyber-criminals instead of buying a product or a service. In the same time the traffic of the site is redirected to a third-party FTP server, meaning the hackers can see live, what you are doing on the site itself. In order to get rid of this nasty piece of scamming code, we strongly suggest that you act immediately, than to risk it to involve you into further trouble. This is why we advise you to follow the removal instructions down below. They are specifically designed to remove any traces of Rodeo browser. But, since this browser may also tamper with crucial Windows components, experts strongly suggest to use an advanced anti-malware software in order to effectively detect all associated files, mutexes, modified registry entries as well as processes that contribute to the running of this web browser on your PC. Threats such as Rodeo browser may be persistent. They tend to re-appear if not fully deleted. A malware removal tool like Combo Cleaner will help you to remove malicious programs, saving you the time and the struggle of tracking down numerous malicious files. Threats such as Rodeo browser may be persistent on your system. They tend to re-appear if not fully deleted. A malware removal tool like SpyHunter will help you to remove malicious programs, saving you the time and the struggle of tracking down numerous malicious files. Note! Your computer system may be affected by Rodeo browser and other threats. SpyHunter is a powerful malware removal tool designed to help users with in-depth system security analysis, detection and removal of threats such as Rodeo browser. 1. Install SpyHunter to scan for Rodeo browser and remove them. 2. Scan with SpyHunter, Detect and Remove Rodeo browser. Ransomware infections and Rodeo browser aim to encrypt your files using an encryption algorithm which may be very difficult to decrypt. This is why we have suggested several alternative methods that may help you go around direct decryption and try to restore your files. Bear in mind that these methods may not be 100% effective but may also help you a little or a lot in different situations. Note! Your computer system may be affected by Rodeo browser or other threats. Remove Rodeo browser by cleaning your Browser and Registry. Fix registry entries created by Rodeo browser on your PC. Combo Cleaner is a powerful malware removal tool designed to help users with in-depth system security analysis, detection and removal of threats such as Rodeo browser. Step 5: In the Applications menu, look for any suspicious app or an app with a name, similar or identical to Rodeo browser. If you find it, right-click on the app and select “Move to Trash”. Step 6: Select Accounts, after which click on the Login Items preference. Your Mac will then show you a list of items that start automatically when you log in. Look for any suspicious apps identical or similar to Rodeo browser. Check the app you want to stop from running automatically and then select on the Minus (“–“) icon to hide it. Remove Rodeo browser – related extensions from your Mac’s browsers. A pop-up window will appear asking for confirmation to uninstall the extension. Select ‘Uninstall’ again, and the Rodeo browser will be removed. When you are facing problems on your Mac as a result of unwanted scripts and programs such as Rodeo browser, the recommended way of eliminating the threat is by using an anti-malware program. Combo Cleaner offers advanced security features along with other modules that will improve your Mac’s security and protect it in the future. Hey !, I found this information for you: "How to Remove Rodeo Tor Browser Scam (July 2017)". Here is the website link: https://sensorstechforum.com/remove-rodeo-tor-browser-scam-july-2017/. Thank you.